As he showed during his 27-hour visit to Morocco 30-31 March, one of the top priorities of Pope Francis is building bridges with Muslim communities. His Morocco trip followed his visit to the United Arab Emirates in early February, culminating in the truly historic document on Human Fraternity for World Peace and Living Together, signed in Abu Dhabi by Pope Francis and the Grand Imam of Al-Azhar Ahamad al-Tayyib. Why did Francis visit Morocco, the 42nd country he has visited, which has a tiny Catholic population of only 23,000, among a Muslim population of 35 million, when he has not yet visited neighbouring Spain, that ancient bastion of the Catholic Church? Morocco was his eighth visit to a Muslim-majority country. It has been spared the excesses of religious conflicts which have destroyed so much of Syria, Iraq, and Afghanistan, and, more horribly, Yemen. But, as in other countries, unemployment of nearly 10 percent, with youth unemployment over 25 percent, played some part in 1500 Moroccans going to fight for Islamic State. Francis is acutely aware of the threat from Islamist terrorism and the devastating consequences of wars in the Middle East, and sees his role as critical in redefining relations between religious traditions by broadening dialogue and cooperation, especially in peace-making, deepening understanding among all religious communities, and collaborating in promoting universal human wellbeing by “reversing the trend of global warming” and achieving “the goal of eliminating poverty”. Francis realises the importance of developing personal links of mutual esteem and respect, and of offering cooperation to address the great challenges of climate change, and improving living standards, education, and migration, burning issues in Morocco. Large numbers of African migrants transit Morocco seeking refuge in Spain and Europe from violence and hunger, just seven miles across the Straights of Gibraltar. Spain received 40,000 undocumented arrivals in 2018. 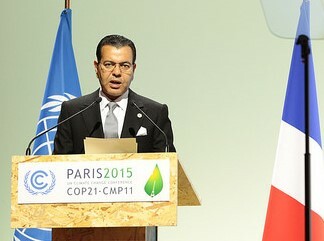 King Mohammed VI of Morocco, speaking at the Paris Climate Conference. In his 30 March address to Morocco’s King Mohammed VI and diplomatic leaders, Francis thanked the King for the opportunity to advance religious dialogue and mutual understanding among the followers of the two religions, following in the footsteps eight centuries earlier of St Francis and Sultan al-Malik al-Kamil. Extending “a hand of friendship is a pathway of peace and harmony for humanity, whereas extremism and hatred cause division and destruction”. Francis said greater solidarity was needed since “our differences and our lack of reciprocal knowledge risk being exploited as a cause for conflict and division”. He continued that it was “essential that fanaticism and extremism be countered by solidarity on the part of all believers”, and he commended the King for establishing his Mohammed VI Institute for “training to combat all forms of extremism” which “constitute an offence against religion and against God himself”. “While respecting our differences, faith in God leads us to acknowledge the eminent dignity of each human being, as well as his or her inalienable rights.” All are created to “spread the values of goodness, love, and peace. That is why freedom of conscience and religious freedom – which is not limited to freedom of worship alone, but allows all to live in accordance with their religious convictions – are inseparably linked to human dignity”. This requires progressing “beyond mere tolerance to respect and esteem for others. This entails encountering and accepting others in their distinctive religious beliefs, and enriching one another through their diversity”, finding ways to work together. Francis commended the International Conference on the Rights of Religious Minorities in Muslim Countries, held in Marrakesh in January 2016. This conference condemned “exploitation of religion as a means of discriminating against or attacking others”. It stressed that religious minorities need to be recognised as citizens with full legal rights. Drawing from the Abu Dhabi Document on Human Fraternity, Francis applauded efforts “to halt the misuse of religion to incite hatred, violence, extremism, and blind fanaticism, and the invocation of the name of God to justify acts of murder, exile, terrorism, and oppression”. The Pope then highlighted the “grave migration crisis”, saying it was an “urgent summons to concrete action” to eliminate the causes of forced migrations. He extolled Morocco as “an example of humanity for migrants and refugees”, so they can find welcome and protection, and build n improved life until it may be safe to return home. “The issue of migration will never be resolved by raising barriers, fomenting fear of others, or denying assistance to those who legitimately aspire to a better life”. True peace also needed social justice to correct “economic imbalances and political unrest” that helped generate conflicts. 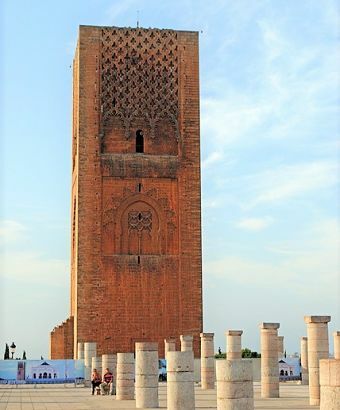 Later that afternoon, in his speech to the King at Rabat’s Hassan Tower, a famous minaret of a 12th century mosque, Francis referred to the Global Compact for Migration, signed by 152 countries. It had been agreed in the Moroccan city of Marrakesh in December 2018, and adopted by the UN General Assembly, with Australia and the United States among only a dozen other countries voting against it. Welcoming, with options for migrants and refugees to enter destination countries safely and legally. Protecting refugees’ rights, independently of their legal status. Promoting, so migrants and their host populations can live in safety and develop their gifts. Integrating, building an open and intercultural society. Francis noted that the Global Compact on Migration called for expanding regular migration channels, as well remedying the causes that force migrants to flee their own countries. The most vulnerable, especially, must be given medical, psychological, and social assistance to restore their dignity. He concluded that “God wants us all to live our lives to the full … for every human being has the right to life, every person has the right to dream and to find his or her rightful place in our ‘common home’! Every person has a right to the future”. The Pope later visited a government-run institute for Muslim imams and preachers, which has trained more than 700 students of African descent since 2015, inculcating interpretations of Islam which oppose fundamentalist violence, and promote religious toleration and cooperation in advancing human and planetary wellbeing. As King Mohammed VI said in his welcome to Pope Francis, “What all terrorists have in common is not religion, but rather ignorance of religion. Today, religion should no longer be an alibi for ignorant people, for ignorance, or for intolerance”. Speaking on 31 March to Catholics and other Christians in Rabat’s Cathedral, Francis urged them not to be concerned that they were such a small group. “Jesus did not choose us and send us forth to become numerous!” Instead, they were to be like the “yeast of the Beatitudes”, living with “fraternal love”. We are not meant to be “the flour”, as if we were to “occupy all the spaces”. During his return flight to Rome, Francis warned that “those who build walls will end up being prisoners of the walls they build; those who build bridges will go forward”. It was a message sent especially to anti-immigrant groups in Europe and the United States. But the situation of people on Nauru and Manus Island also comes to mind.